Sympathetic Threads | I myself am made entirely of flaws, stitched together with good intentions. The big family wedding was on Sunday, and yesterday at the post-celebratory get-together I was able to give my lovely niece and her wonderful new husband the small extra gift that I had stitched for them. 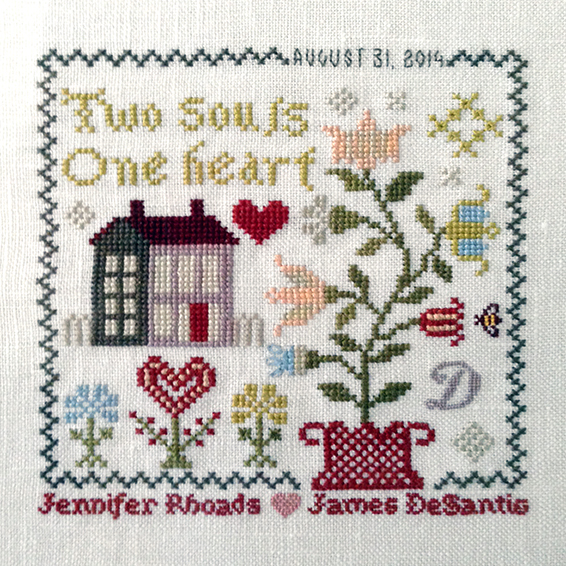 To my adaptation of the Blackbird Designs “Heart in Bloom” chart (I adjusted the border, reworked the letters and changed some of the floss colors), I added their names and a large capital to highlight their newly-shared last name, plus I included their wedding date, of course. I think that the kids appreciated that I made them something from the heart. As I mentioned in my last post, my name Deborah means “bee,” so I always like to add a bee or two as tiny accents to my stitching projects when possible. I especially use bees as my signature on pieces that I am personalizing as a gift for someone and where signing with my own initials just won’t work. 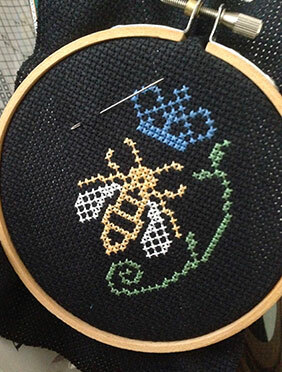 Hence I have a Pinterest board devoted to “Small Cross Stitch Motifs,” where I have collected several tiny cross stitch bee images (amongst other things) from which I can choose. I often use the simplest of designs, usually because I have only a very tiny area left to fill (sometimes only a 6 stitch width!) 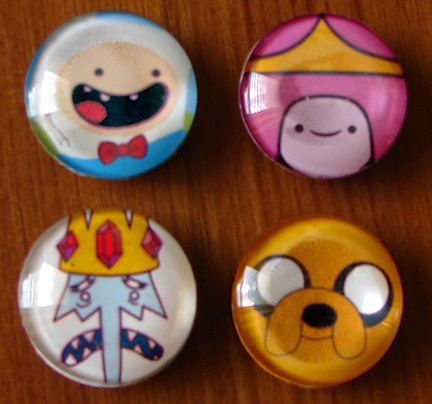 on any project, and I much prefer primitive-style or very stylized designs for my pieces. 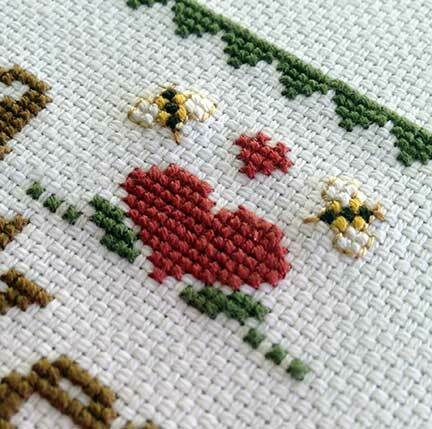 But I am always on the lookout for any type of tiny cross stitch bees that might be useful in the future! 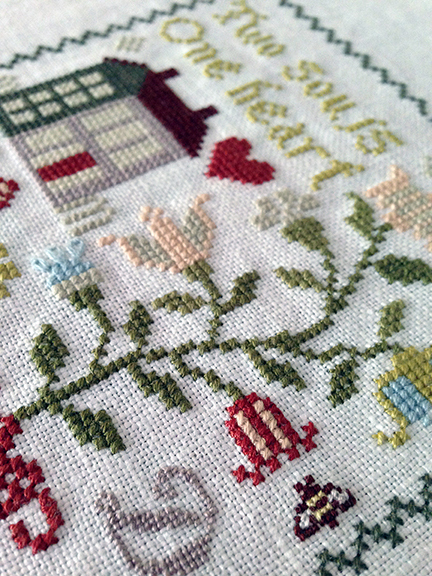 I’ve finally finished Blackbird Designs “Heart in Bloom.” Such a long time to complete such a small project! 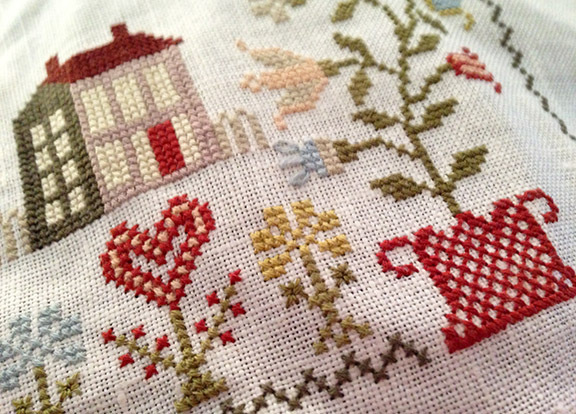 I really enjoyed stitching this because it is a gift for two people whom I dearly love. I stitched the names of the recipients at the bottom under the border, which I revised to better suit my needs, and I also added a tiny bee as my signature to the right of one of the flowers. I like to add bees because my name means “bee,” and try to include one in every project, if possible. I’ve purchased a lovely square frame from Michael’s Crafts for this, but am not completely certain about the look, and so will wait until the weekend to decide. 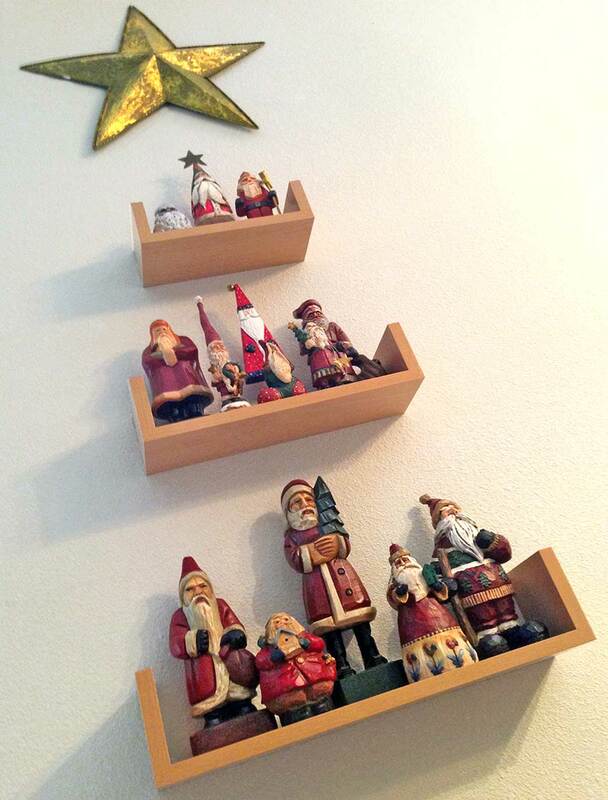 Overall, though, I’m quite happy with the way this little project turned out. 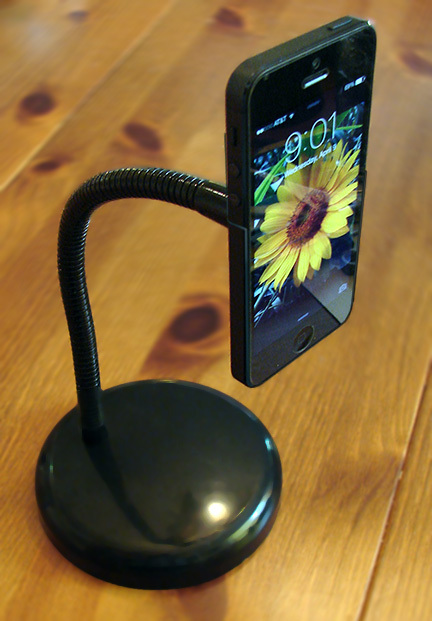 So I looked around online for inexpensive DIY ideas for a sturdy, flexible, hands-free iPhone stand, and few days ago I found what looked like the perfect tutorial here. This showed how easy it might be to make exactly what I needed for nothing, out of spare parts already laying around my house. I knew I had to give it a try. Following the very simple instructions, I cobbled together part of an old, broken gooseneck lamp, a 1/2-inch hex nut and a spare suction cup. Well, to be completely honest, the end result wasn’t completely free, I did spend 30 cents for the hex nut at my nearby Lowe’s hardware store. After the E-6000 multi-purpose adhesive (my new favorite stickum) had completely dried, everything screwed together easy-peasy and exactly as shown in the video, however I found that the suction cup had trouble maintaining a good grip on the lightly textured back of my iPhone 5. Basically, because of its non-slick surface, my phone would eventually fall off of the suction cup mount after about two minutes. This was certainly not acceptable. I pondered this problem for awhile and realized that a new or stronger suction cup was probably not the answer, I needed an even more secure mounting. Then I got the idea of cannibalizing one of my old and now useless iPhone 4 cases by trimming off the upper edge so that the taller iPhone 5 would fit inside. I trimmed the old case with my tin shears, made sure to sand off any rough edges with a metal file, and then just glued the suction cup connector to the back of the truncated case, et voila! My iPhone 5 easily slid right into its new and very secure holder. Happy to report that my new phone stand works beautifully! I can adjust the phone for either landscape or portrait configuration and the height is just perfect for using Facetime. The only thing I haven’t done yet is cover the back of the case where the suction cup and nut are attached with some black felt from my stash. As suggested in the video, this would give my new stand a neater look from behind. But hey, no hurry, I don’t look at the back anyway.